Translucent impresses with its unique configuration that cohesively brings together different elements to present a timepiece that is sleek, youthful and truly exclusive. 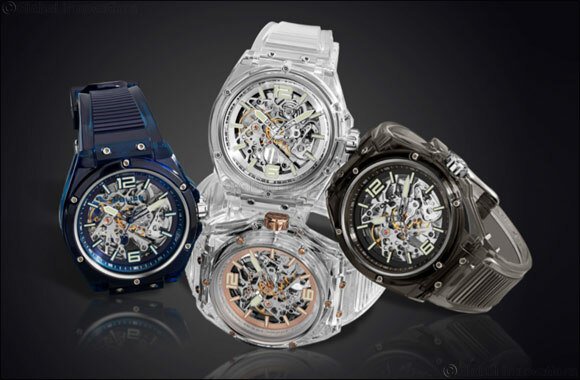 The skeleton dial gives a glimpse into the inner workings of the automatic movement and the polyurethane body equips the timepiece with style and charisma. With luminescent indices, hands and decorative metal screws on the bezel, Translucent has a clean silhouette that is deft with details and functional elements. The timepiece is available in four exceptional colour variations – clear, clear with rose gold, black and navy blue. While the striking design and features are sure to garner praise, it is the impressive price segment that makes Translucent a remarkable collection. Featuring technology and automatic movement that is characteristic of high-end timepieces, Translucent is an extraordinary timepiece that offers a plethora of features at an attractive price point. 1983: A handful of designers impose their own personal taste on the fashion market, while others follow their lead. Not POLICE. Right from the start, POLICE has stood for defining your own style—one that lives and thrives away from the catwalks and transient trends. That same year, POLICE released its first collection. People loved it. It explored the excitement and independence of underground US culture. From that generation onwards, the brand has always spoken the language of freedom and rebellion. POLICE was, and is, daring. Both in its style and in the quality, the innovation,the pioneering design of its glasses. Wearing POLICE is asserting your own personality. The early days of rugged, on-the-road imagery might be over. But audacity and determination are still very much part of the POLICE DNA. That same DNA that now thrives in POLICE watches, fragrances, jewels and leather goods. The POLICE story isn’t merely that of a brand. It’s a 35-year-old evolution of the idea of freedom.